We’ve put together a list of the most frequently asked questions. If you have a question that is not listed here, please feel free to contact us. Electrostatic is based on the principle that opposite charges attract and like charges repel. Two positively charged things will repel each other. Using this natural electrostatic phenomenon, Victory has developed a patent pending, breakthrough, cordless application technology. 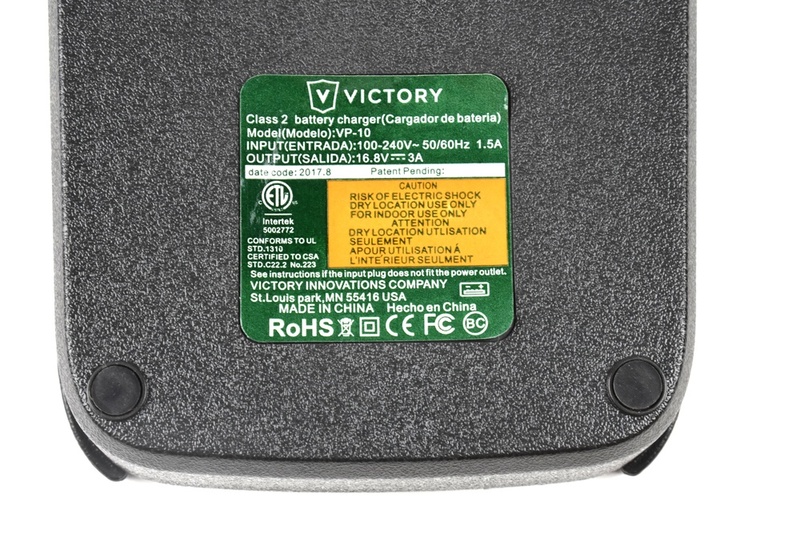 The Victory Innovations Cordless Electrostatic System places a positive charge on the liquid before entering the nozzle allowing the maximum levels of liquid to be charged and sprayed at negatively charged surfaces (most surfaces are either negative or neutral) allowing for a more complete coverage of the targeted surface. What do you mean it inserts a charge into the liquid? Using our patent pending technology, the process of positively charging the liquid starts at the charging ring and flows to the tank. This way all the liquid has a positive charge prior to reaching the nozzle. As most surfaces are either negative or neutral, the dispersed droplets spread out more evenly and seek out a negative or neutral surface. The end result is that the liquid can be applied faster, using less liquid and achieving a more complete coverage of the surface. Do I need to wipe the area after I use the sprayer? That depends on the chemical being used. There are many sanitizers and disinfectants that require no rinsing or wiping required after application. Always check with the chemical manufacturer if you are unsure. How will this save me time and money? In testing, we found our Cordless Electrostatic System is 70% faster and uses 65% less chemicals than a traditional sprayer. That’s a significant increase in efficiency that will definitely save you time and money. There are many variables that can affect drying times including temperature, humidity, particle size, and the chemical used. The Victory 3-in-1 nozzle allows you to select from three different size particles which can help you customize the drying time. Do you sell the cleaning solutions? No, Victory Innovations does not offer a line of chemicals. We only offer application devices that can spray many different types of chemicals. Please follow the instructions on the label for personal protection equipment required for the specific chemical you intend to spray. See the chemical manufacturer’s guidelines if you have application questions. The maximum spray distance is up to 5 feet but we recommend the optimum range for complete coverage is 20-30 inches depending on the nozzle selection. We also offer an extender wand that increases the reach. Yes, it comes with a 16.8 Volt Lithium-Ion Battery (VP20) that lasts up to 4 hours. The charger comes with each sprayer. Can I buy an additional battery? 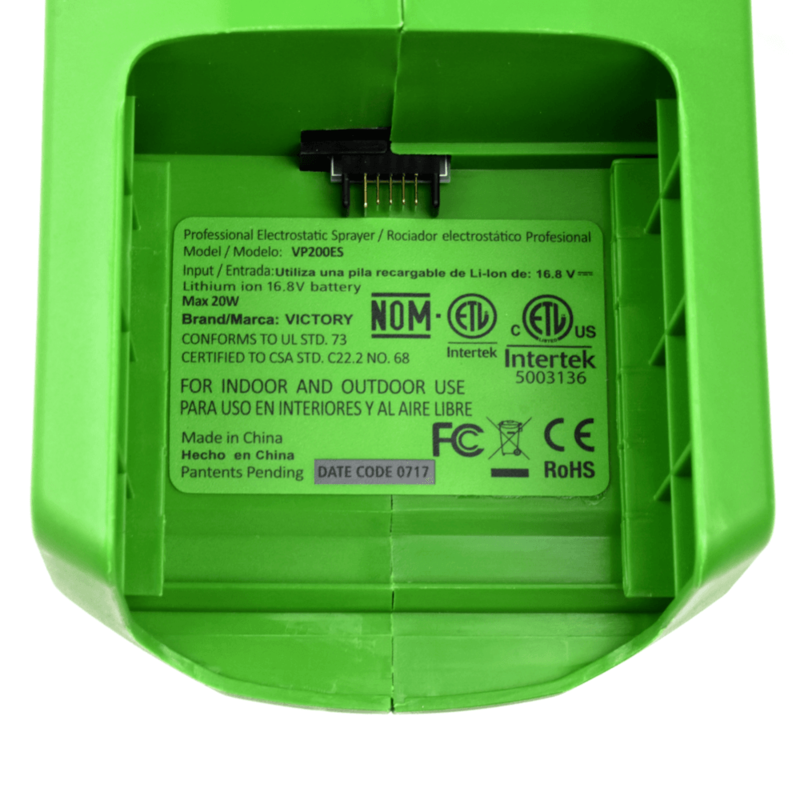 Yes, you can buy a 16.8 Volt Lithium-Ion Battery (VP20B) which will last up to 8 hours. 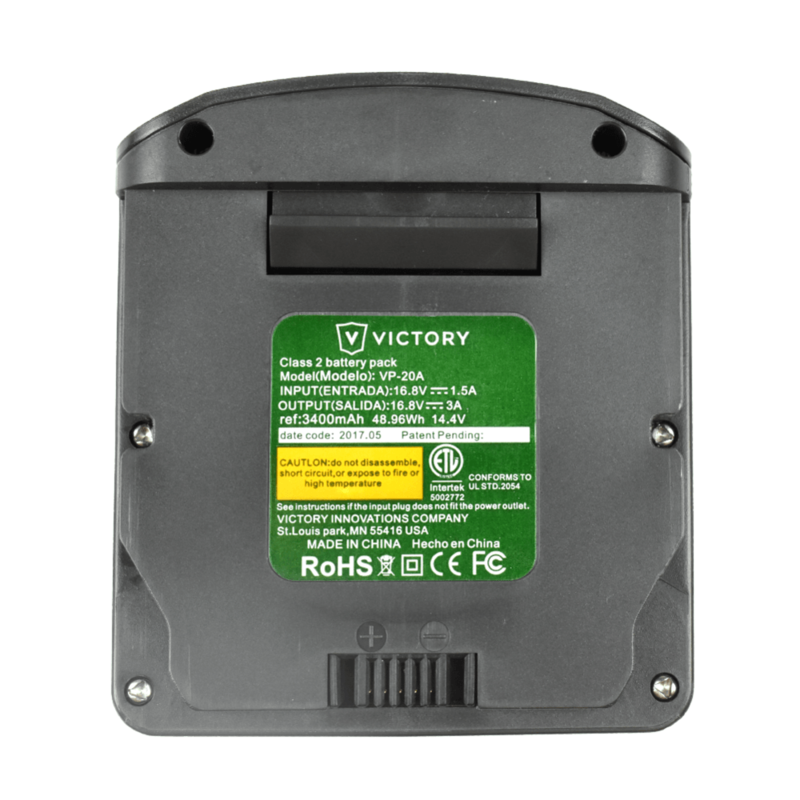 For further detail of warranty coverage and warranty repair information, email us at customerservice@victorycomplete.com. If your warning labels become illegible or are missing, email us at customerservice@victorycomplete.com for a free replacement. Are there any cleaning or maintenance tips you can share? a. After each use before storing or before switching chemicals, spray water through the machine for 20 seconds to rinse out the line of any leftover chemicals that may start to build up. b. Do not transport or store chemicals in the tank while connected to the sprayer. If you want to store chemicals in the tank, we recommend you purchase a tank cap and seal up the tank during transporting and storage of the sprayer. 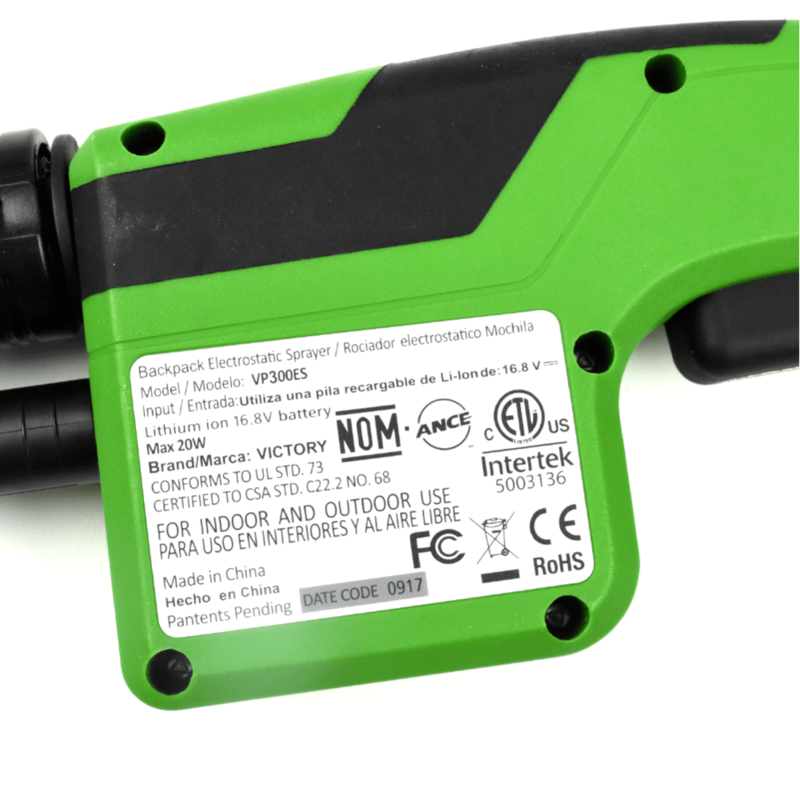 If you do not empty the tank, the user runs the risk of the liquid spilling in the case and damaging the electrical board in the unit or in the battery. c. A plugged nozzle can occur if the machine is not regularly rinsed. If you have a plugged nozzle, remove the nozzle, soak in hot, soapy water for 10 minutes, then blow out the nozzle with compressed air. Watch our video on cleaning and maintenance to see a demonstration. Our products are certified compliant with the standards and requirements of the ETL (Edison Testing Lab), the CSA (Canadian Standards Association), the FCC (Federal Communication Commission), the CE (European Commission), the RoHS (Restriction of Hazardous Substances), and the NOM (Mexican Official Standards). How can I register to be a distributor? If you are in the business of distributing products you can register to become a distributor. You should receive an answer to your application within 2-3 business days.